"The report confirms South Africa’s position as an entrepreneurial leader on the continent and provides an insightful road map for us to focus in on those areas that will provide the greatest leverage for accelerating our entrepreneurial ecosystem even further,” says Anthony Farr, CEO Allan Gray Orbis Foundation. "According to a report by the Global Entrepreneurship and Development Institute, South Africa has been named one of sub-Saharan Africa’s entrepreneurial front-runners, ranking second place, after African counterpart Botswana." "This report opens up the black box between investment in digital infrastructure and economic progress. Whilst high-income countries such as the US, Canada, Australia, and the UK top the index, we also see that many Latin American countries are ‘punching above their weight’ and look set to make good progress in developing their digital economies." TIDL La Vanguardia 8 June 2016 "El TIDL también ve necesario que los países establezcan políticas destinadas a acompañar la innovación, las competencias electrónicas, las actitudes culturales y el ecosistema de las nuevas empresas." TIDL The Next Web Conference 7 June 2016 "This is why the Index is so interesting. It doesn’t just look at tech – it looks at the conditions that allow citizens of a given society to use digital technology to improve their lives. After all, the greatest tech in the world is next to useless if you don’t have the skills or freedom to use it." TIDL The LSE Media Project 23 June 2016 "The Index is a rich starting point for further research and debate. I am among the researchers who plan to take these country-level indicators as a starting point for more contextualised research, in order to develop case studies that illustrate and explain different experiences of digitalisation." GEI CNBC 19 November 2015 "The Index is important because more countries are looking to entrepreneurship to create needed jobs. In developing countries with rapidly growing populations of young people, many young adults are currently unemployed or underemployed." GEI CNBC 12 November 2015 "The world is operating at 52 percent of its entrepreneurial capacity, according to the Washington, D.C.-based Global Entrepreneurship and Development Institute (GEDI). To get closer to 100 percent, more countries will need to step up and start helping to create new businesses. And they are, across every region." FEI London Sunday Times 14 June 2015 "Siri Terjesen, co-author of the index for the Washington-based GEDI Institute, said: “UK female entrepreneurs are on average more innovative than their European counterparts." FEI India Times of India 25 June 2015 "Ainsley Lloyd, researcher at GEDI and co-author of the 2015 research report, said India had actually improved by 4 ranks...But the country needs to do much more to improve the ecosystem for its women entrepreneurs. According to Lloyd, increasing access to bank accounts, financial training programs and improving gender diversity across sectors were key areas for improvement." Female Entrepreneurship Index UK The Independent 30 November 2014 Small Talk: Small businesses are failing to hire more female directors - "The Gender Global Entrepreneurship and Development Index, published last year, put the UK sixth out of 17 countries in a ranking of the best places to be a female entrepreneur, behind the US, Australia, Germany, Mexico and France. The study concluded that the UK was particularly poor at encouraging women enrolled in higher education to think about starting their own businesses rather than working for someone else. It also put the UK 17th out of 17 on the willingness of women to take risk in the workplace, which suggests we haven’t done enough to give women the belief they can make the leap to entrepreneurship." GEI Denmark Copenhagen Capacity 24 November 2014 "Denmark takes a sixth place on the Global Entrepreneurship Index 2015, ranking top on factors such as opportunity start-up, human capital, competition and product innovation." GEI Amex Open Forum 19 November 2014 "According to the 2015 Global Entrepreneurship Index (GEI), the United States has the best “entrepreneurial ecosystem” out of 130 countries, beating out Canada, Australia, the United Kingdom and Sweden for the top spot. Not only did the United States maintain its “most entrepreneurial country” superlative, its score grew by three points on the GEI scale, hitting a “historical high,” according to the report. But even though the U.S. has this new ranking under its belt, it can still stand to learn a thing or two from other countries on the Index when it comes to job training and work-life balance." GEI The Telegraph 20 November 2014 UK is 'most entrepreneurial' country in Europe - "The UK has been ranked the fourth most entrepreneurial nation in the world, beaten only by the US, Canada and Australia. The UK's showing has improved steadily over the past three years: in 2012 the UK ranked 14th and in 2013 it ranked ninth. Business secretary Vince Cable said of the GEI: "From building cutting-edge robots to designing satellites, British entrepreneurs succeed through combining innovation with strong business acumen." Estonia entrepreneurial ecosystem report Estonian World 20 November 2014 "Like all countries that have reached the innovation-driven stage, Estonia needs to nurture its entrepreneurial potential, the report suggests. It argues that to harness the potential of entrepreneurship and innovation, Estonia does not necessarily need more entrepreneurs; it needs better, innovative and growth-oriented entrepreneurs." GEI South Africa Allan Gray Orbis Foundation blog 20 November 2014 2014 Global Entrepreneurship Week lights an entrepreneurial fire across the globe - "Firstly the launch of the 2015 Global Entrepreneurship Index measuring the entrepreneurial ecosystems in 130 countries—from Albania to Zambia. South Africa ranked number 52 in this index and was the highest ranked country in Africa. 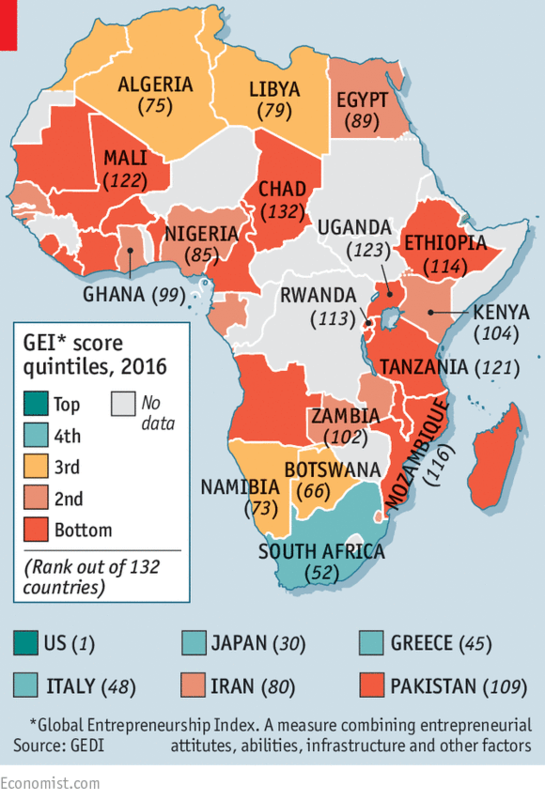 This is a positive development relative to South Africa’s performance in the annual Global Entrepreneurship Monitor where we have tended to lag other African countries. The bad news is that our areas of weakness continue to be around human capital and start up skills." GEI Tech City 20 November 2014 "Conclusions From the Recent Global Entrepreneurship Index Show That the UK is Now the Most Entrepreneurial Country in Europe." GEI Sri Lanka Lanka Newspapers 24 November 2014 "Perhaps reflecting the post-war opportunity and improved country profile, Sri Lanka has debuted in the influential Global Entrepreneurship Index (GEI) 2015, ranking at 71 out of 130 nations surveyed and 11th within the Asia Pacific region." GEI Pakistan TechJuice 28 November 2014 Pakistan’s Global Entrepreneurship Index Reveals A Need For Massive Improvement - "Pakistan is ranked at 123 on the Global Entrepreneurship Index (GEI) 2015 out of 130 countries with GEDI score of 20.1. The bottom position signifies weaknesses in the attitudes and abilities, emphasized by lower scores in human capital, technology absorption, start-up opportunity, start-up skills, risk acceptance, and networking." Schumpeter: "Uncorking enterprise: Policymakers are desperate to promote enterprise. A new index could help." "Competing indices jostle in the intellectual marketplace: the World Economic Forum’s Global Gender Gap ranking, published last week, goes head to head with the UN’s Gender Inequality Index, the Index of Women’s Power from Big Think, an internet forum—and even The Economist’s own Glass Ceiling Index. Worse, some indices are pointless or downright misleading."